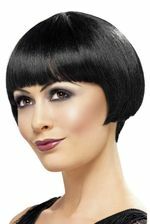 Sleekly styled for adventurous women of all dispositions, this chic black bob wig with bangs is a must-have for fun-loving flappers and sultry supermodels. 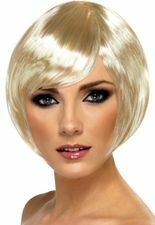 It has a helmet shape with an in-curled bob cut that frames the face and highlights your best features. 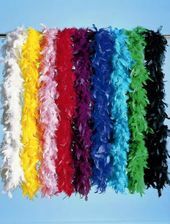 This costume wig is made from 100 percent synthetic fibers (can be paired with a nylon wig cap for a natural look) and comes in a single size to fit most adults. 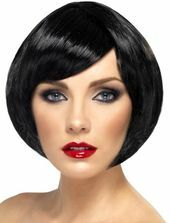 We also recommended this black wig for a Mia Wallace costume, Velma Kelly costume, French mime costume, go go dancer costume and more. Shop our complete collection of chic 1920s wigs for more ideas. 100% synthetic. One size adult.